A gorgeous crowd convenes at this West Hollywood staple. The space is decked out in blue leather with patterned floors and chandeliers lending a Rome-in-the-mid-’60s feel. The Venetian cuisine and endearing staff are equally “fabulous”, and if you go for brunch on the patio, you’ll feel like a movie star. Of Note: Enzo Cecconi – the youngest ever general manager of the famous Cipriani restaurant in Venice – came to London in 1978 and opened the very first Ceoconni’s there. 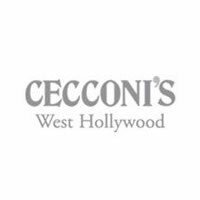 Now owned by Soho House, Ceconni’s recently opened a third location in Miami Beach, at the Soho Beach House.